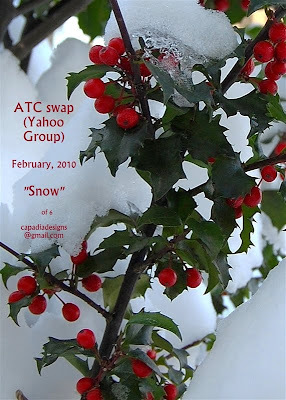 The theme for my small ATC group this month was "snow." I usually think of shades of blue to go with snow themes, however, since it was Valentine's month, I decided to use pink and red for a change. 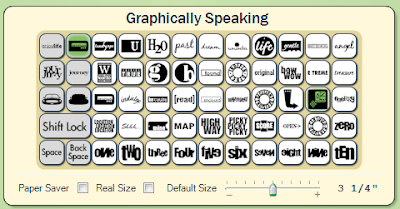 I started with this image on the Graphically Speaking cartridge. This is one of my favorite cartridges - there is so much variety and lots of unique cuts that are not repetitive with other cartridges. It came out at the same time as Storybook and while Storybook was an early favorite, I think a lot of people were pleasantly surprised but the versatility of Graphically Speaking. I have used this image for an A2 card before - here is a LINK to the post. Artist Trading Cards must be 2 1/2 inches by 3 1/2 inches. I wanted to layer this image on the base card so I set the slider bar for 3 1/4 inches. Then I set the width to 2 1/4 inches. In the image above you can see the original square image and my adapted image. The design has some contour lines around the edges which I hid using "hide selected contour." I also decided to hide the snowflake cut out. I created eight of the ATC tops. 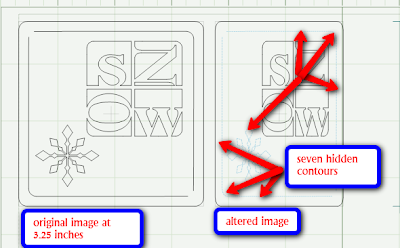 Unfortunately, it is not currently possible to copy and paste an image with contours hidden and have them remain hidden. So I needed to hide seven lines eight times (it didn't take long). 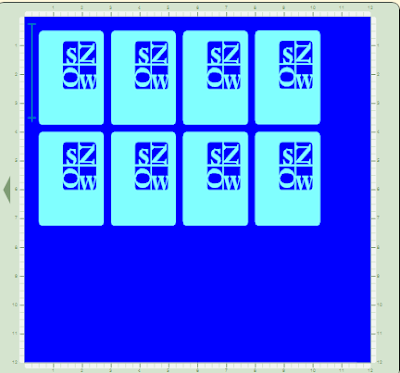 I previewed the cuts by placing a full sheet square in a contrasting color on a second mat. 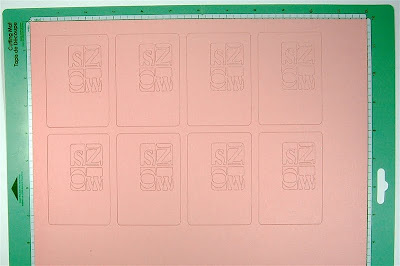 I cut the tops in pale pink textured cardstock. 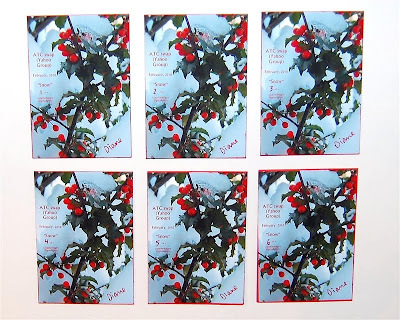 I used a photo I took last winter for the backs of the cards. This is a holly bush in our back yard covered with snow. I brought the photo into my Creative Memories StoryBook Creator Plus 3.0 software to edit, resize and add the words. I worked at 5 x 7 to make it easier - this is exactly twice the size of the ATC so I know that it will shrink proportionately for printing. When my image was ready, I saved it to my desktop as a JPEG and then imported it into my Creative Memories Memory Manager 3.0 software for printing. 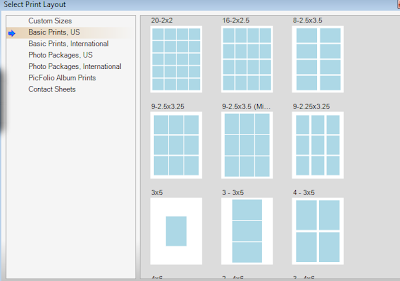 This program has standard package layouts which makes it very easy to print a sheet of 2 1/2 x 3 1/2 inch images. 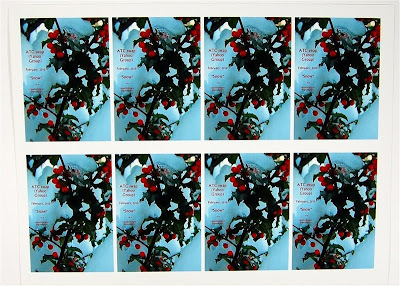 Here you can see the sheet of eight ATC backs that I printed on matte photo paper (8 1/2 x 11 inches). 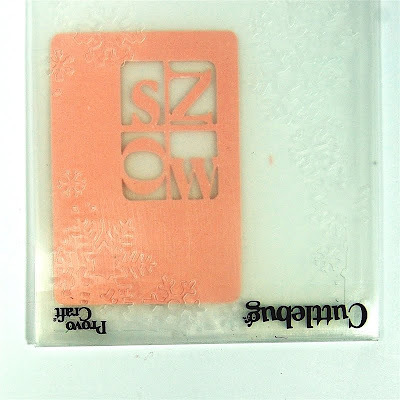 I trimmed the images just a tiny bit inside the printed area to be sure that they would not be seen on the front side of the ATC. 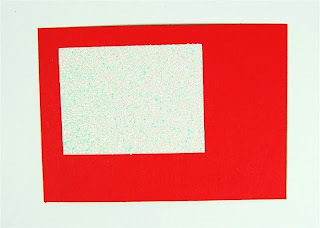 Then I inked the edges with red ink to hide the white contrast against the red base card. I cut small pieces of white glitter cardstock to fill in the window behind the letters. It looks very sparkly and snowy. I didn't want to add the weight and bulk of a full glitter layer to the cards. 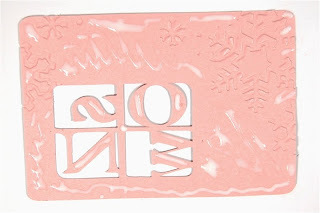 I carefully placed the card topper in the snow Cuttlebug embossing folder from the Oh My Crafts exclusive holiday bundle. 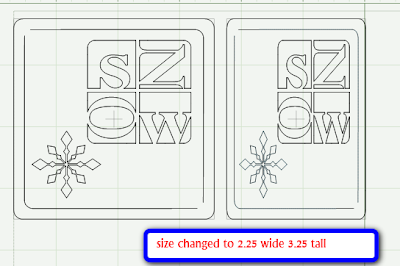 I planned the placement of the embossing to fill the corner where the snowflake cut had been in the original design. Here are all of the components of my ATC ready to assemble. 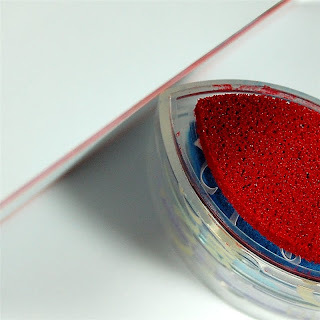 I used my Precision Point Adhesive to adhere the embossed topper to the red card base, sandwiching the glitter layer in the window opening. and back. I have filled in the number of each ATC and signed them on the back. After I had packaged and mailed the ATCs, I realized that I hadn't added the small pink gem to the cards. I guess I will be sending them individually to my swapping partners so they can stick them on if they would like to "fix" my mistake.. The moral of the story - try not to craft when you are suffering with a bad head cold and not thinking sraight! I wasn't able to get the ATCs for my large group done in time and will do them and send with the next monthly group for March. Tomorrow it will be two weeks since the fire that destroyed our neighbor's home. Thank you so much to those of you who have sent cards to cheer them and amuse the children. If you wanted to send a card and need the information here is a LINK to the blog entry with the details - just scroll to the end of the post. 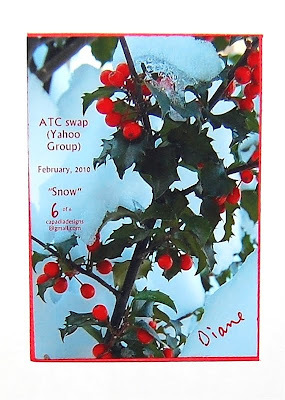 Diane - Your ATC's are beautiful. I love your step by step directions...it makes me feel like even I could do this! Thanks for explaining what you did using CM software. I have the programs & haven't used them yet. Love your atc card and have noticed you make the cutest atcs always. I am never disappointed. Would be great to try one but I can't be distracted from my scrapping.